The reputation that we enjoy at Hoover Slovacek LLP is a result of the hard work and dedication of our entire legal staff. Melissa Haselden is an attorney in the Hoover Slovacek LLP bankruptcy practice, who concentrates her practice primarily in the area of commercial bankruptcy. Ms. Haselden represents both debtors and creditors and has been practicing bankruptcy law and creditor’s rights for 15 years. Ms. Haselden has successfully utilized the Chapter 11 bankruptcy process to help restructure numerous debtor businesses in such diverse fields as manufacturing facilities, real estate developers, apartment projects, health care service providers, funeral homes, retailer services, private schools and other service based enterprises. These business clients range from small, family owned companies to large, complex corporations. Ms. Haselden works with her debtor clients to formulate and implement a strategic course of action in a bankruptcy, which will ultimately result in confirmation of a Chapter 11 plan. Ms. Haselden also draws on her prior business background and experience to help clients through the Chapter 11 process. Ms. Haselden’s Chapter 11 creditor work has included representing the interests of various creditors in Chapter 11 matters including landlords, institutional lenders, secured creditors, unsecured creditors and bankruptcy trustees. 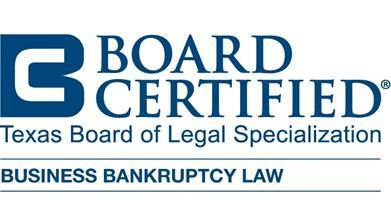 She also represents debtors in commercial Chapter 7 cases and creditors in Chapter 7 and Chapter 13 cases. She has successfully represented many debtors in out-of-court work outs or standstill arrangements. Representative Chapter 11 cases include debtor representation in: Gulf Coast Glass & Erection Co. d/b/a Vision Products, Texas Systems and Controls, Master Tile, Sentry Operating Company of Texas, Sterling Affiliates, Ltd., Goldstar Emergency Services, Inc., TKO Sports Group, Inc., Cottage School Systems and Diagnostic Clinic of Houston. By representing both debtor and creditor clients, Ms. Haselden has attained a balanced perspective of the Chapter 11 process and is better able to effectively represent the client. Whether prosecuting or defending an action, Ms. Haselden utilizes a practical business approach to helping her client’s work through the bankruptcy process in a cost-effective manner in order to obtain optimal results. Prior to entering private practice, Ms. Haselden was the Director of Operations in the transportation industry for Exel Direct, formerly known as Merchants Home Delivery Service. During her tenure, Ms. Haselden was the first female in the company’s history to attain the position of Senior Account Executive. As Director, Ms. Haselden specialized in intensive contract negotiations and client interaction, supervised six locations and managed over 140 employee and contractors. Ms Haselden also maintained responsibility for achieving multimillion-dollar budgetary goals. Best Lawyers is ® Woodward White, Inc.